Domenico Ghirlandaio Adoration of the Shepherds (1483-1485) He lived from 1448-1494. Ghirlandaio (original name Domenico di Tommaso Bighordi) was an early Renaissance painter of the Florentine school noted for his detailed narrative frescoes, which include many portraits of leading citizens in contemporary dress. Domenico was the son of a goldsmith, and his nickname “Ghirlandaio” was derived from his father’s skill in making garlands. Domenico probably began as an apprentice in his father’s shop, but almost nothing is known about his training as a painter or the beginnings of his career. The shepherds’ adoration of the child is described in Luke 2:16: “So they went with haste and found Mary and Joseph, and the child lying in the manger.” The Adoration of the Shepherds, in the Nativity of Jesus in art, is a scene in which shepherds are near witnesses to the birth of Jesus in Bethlehem, arriving soon after the actual birth. It is often combined in art with the Adoration of the Magi, in which case it is typically just referred to by the latter title. The Annunciation to the Shepherds, when they are summoned by an angel to the scene, is a distinct subject. Domenico Ghirlandaio, working south of the Alps in the city of Florence, painted a major altarpiece depicting the Nativity and Adoration of the Shepherds for Francesco Sassetti’s sepulchral chapel in Santa Trinità. This painting in some ways typifies the characteristics of the Italian Renaissance (modeling of the figures, local color, anatomical proportion, realistic perspective, use of antiquity), yet it incorporates Northern Renaissance elements in a manner not done prior and never repeated again. This Annunciation to the shepherds forms a distinct subject in Christian art and is sometimes included in a Nativity scene as a peripheral feature (even though it occurs prior to the adoration itself), as in the 1485 scene by Domenico Ghirlandaio, where it can be seen in the upper left corner. Ghirlandaio also shows a procession of Magi about to arrive with their gifts. The visual depiction of the Nativity typically shows the Virgin kneeling next to the Christ child lying before her, while Joseph can be found somewhere else in the composition, usually off to one side as in the Portinari panel. Joseph here is in the exact center of the painting. The type, an old man with gray hair, remains. Joseph shades his eyes with his hand as he looks upward towards a flying angel. Of course, the focus of the Nativity is on Mary and Christ, not Joseph. This point is made clear from the inscription on the painting’s frame: “IPSVM QVEM GENVIT ADORAVIT MARIA” (Mary adored the very one whom she bore). The double focus on Mary and the Christ Child is indicated by other elements as well. The Virgin, triangular in form, is given a place of importance in both compositions. Ghirlandaio allowed the traditional Florentine red gown to be seen from beneath the navy mantle which, while retaining the solemnity of the figure, draws the viewer to the beauty of her face. The facial type is most certainly based on a Florentine rather than a Netherlandish female model. The contours and shadows on her face and neck, which emit an internal glow, exemplify Ghirlandaio’s highly effective use of light and color. He carefully arranged each form and its lighting so that where the edge of the form meets the background there is an opposite light level to ensure that the outline of the form is not lost. Ghirlandaio depicts Mary not only as a woman who reflects upon the Savior, but also a mother who looks at and prays for her child. This eliminates the physical and emotional distance between the Virgin and Child apparent in the Van der Goes painting. The intimacy and relationship between mother and child is further emphasized in the Ghirlandaio painting by the placement of the infant on the fanned-out mantle of the Virgin. The shape of this drapery extends the beauty of the Virgin to the most sacred area of the composition, the body of Christ. Ghirlandaio’s drapery provides a soft material for the infant’s body and covers the sheaf of wheat, symbol of the Eucharist, under his head. Not so subtle is Ghirlandaio’s use of a sarcophagus for the Savior’s manger. 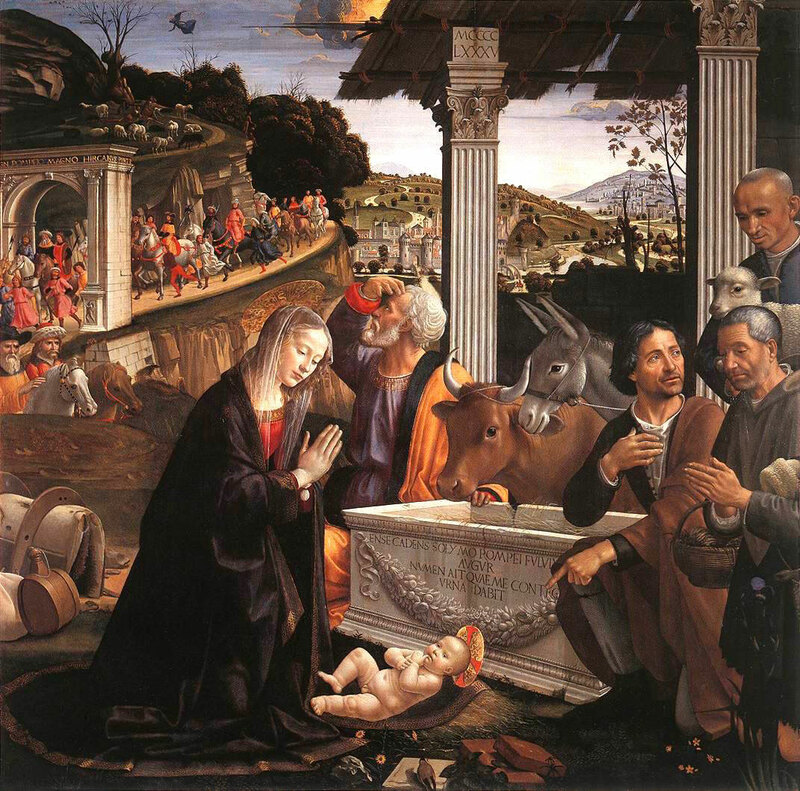 Ghirlandaio, like Van der Goes, inserts symbolism in seemingly irrelevant details of the nativity scene. Several of these details provide additional confirmation of the connection between the infant Christ’s birth and passion. Ghirlandaio’s placement of a lamb in the standing shepherd’s arms not only identifies the shepherd’s occupation but also is a well-known symbol of Christ’s atoning death (cf. the words of John the Baptist in John 1:29: “Here is the lamb of God who takes away the sin of the world!”). Ghirlandaio has a goldfinch, again a symbol of Christ’s passion. Classical elements are a common feature in Florentine paintings by 1483. For instance, the pilasters supporting the sarcophagus and the triumphal arch have inscriptions that introduce the theme of the successive reigns of the Hebrews, the Romans, and of Christ, through the story of the Roman general Pompey. The inscription on the triumphal arch through which the Magi pass cites the Roman general who conquered Jerusalem: “GN[AEO]. POMPEIO MAGNO HIRCANVS PONT[IUS]. P[OSUIT]” (Hircanus, High Priest, Erected This For General [Imperator] Pompey the Great). This inscription suggests that the Jewish High priest, Hyrcanus, erected the monument in gratitude to Pompey, who after the conquest of Jerusalem reinstated him in his office. The manger-sarcophagus used for the Savior’s crib, together with the ancient pilasters supporting the roof, are the foundations for the new temple succeeding its Hebrew and pagan predecessors. The letters on the sarcophagus read: “ENSE CADENS SOLYMO POMPEI FVLVI[VS] / AVGVR / NVMEN AIT QVAE ME CONTEG[IT] / VRNA DABIT” (Falling at Jerusalem by the sword of Pompey, the augur Fulvius says that the urn which contains me shall produce a God). If the first inscription on the arch indicated the triumph of paganism over Judaism, this second signifies the victory of Christianity over the heathen world. 5. The most distant hill on the right is believed to be Jerusalem with the Dome of the Rock visible. In the center of the background is a view of Rome, which includes the Torre delle Milizie and the mausoleum of Hadrian. Therefore, the two world empires, Hebrew and Roman, are now in the background to the beginning of Christ’s new kingdom. Luke, like Ghirlandaio, was also interested in the relationship between things religious and political, though the two seem to have construed that relationship quite differently. Luke alone among the Evangelists takes pains to set the story of Jesus’ birth against the backdrop of the Roman Empire. Luke’s “peace” that Christ’s coming brings is celebrated by the angelic host before the shepherds. The contrast between Christ’s peace and Augustus’s Pax Romana was surely clear to Luke’s audience. Though scholars disagree about exactly how, almost all agree that in his second volume, the Acts of the Apostles, Luke attempts to legitimate Christianity, then a tiny Jewish messianic set, within the larger Roman empire—trying to forge a way for the movement to survive while at the same time holding true to its central tenets. By Ghirlandaio’s day, of course, hindsight shows that Christianity has triumphed and stands in a succession of “global” empires from the Hebrews to the Romans to the Christians. Ghirlandaio’s Adoration of the Shepherds, like the Gospel of Luke before it, makes the bold move of placing Christianity on the larger political landscape. And like the Third Gospel before him, Ghirlandaio makes the audacious claim that the transition of dominance from the Romans to Christianity is to be found not in Emperor Constantine’s conversion or his mighty Christian army, but rather in the birth of a child who is first adored by lowly shepherds rather than cosmopolitan Magi. 6. Ghirlandaio himself appears in the scene, dressed as a shepherd. He is even allowed to come closer to the Christ Child than the donors, who appear in frescoes to the right and left, praying outside the confines of the panel. The artist, who is leading the shepherds, is kneeling and bringing the miracle of the birth of Christ to the attention of both the shepherds and the observers of the picture. His left hand, with which he is pointing to the Christ Child, is finely drawn and is superbly modelled in three dimensions. With his right hand, his painting hand, he is pointing to his chest.